This entry was posted in Mood Disorders on September 27, 2013 by jnorman. Is the Cure for Brain Disorders Outside the Brain? Could it be that we are looking in the wrong place for the answers to our epidemic of neurological and psychiatric disorders? Could it be that our psychotropic medications attempt to control the smoke while ignoring the fire? A Cure for Brain Disorders Outside the Brain? This entry was posted in Mood Disorders on September 3, 2013 by Joy Ross. There is an urgent need for an approach to treating depression that goes beyond that of conventional pharmaceutical, psychological, and other types of interventions. There are many other influences on depression that are usually not assessed or are given only passing notice in the conventional model. In this attached reading, examine the scientific research on dysregulation in a variety of areas. In functional medicine, these diverse influences are seen through a prism called the Functional Medicine Matrix Model. 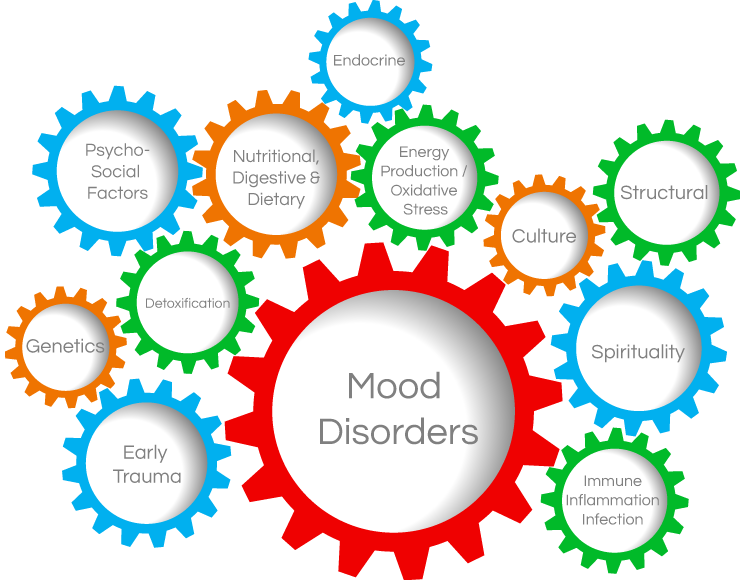 Evaluating these core systems helps to uncover a rich collection of underlying antecedents, triggers, and mediators that may be linked to depression. Remediating underlying dysfunction is likely to have a highly beneficial effect on many patients with depressive disorders, resulting in improved outcomes for a greater number of people. This entry was posted in Depression, Mood Disorders on September 3, 2013 by Joy Ross.